MAD has a long history of running a wide variety of material on our back covers: fake ads, magazine parodies, comics, and more. To wrap up 2012, each member of the MAD staff selected a favorite back cover and explained why this one stands out above hundreds of others. Come back tomorrow to see another pick, and to read them all, click here! 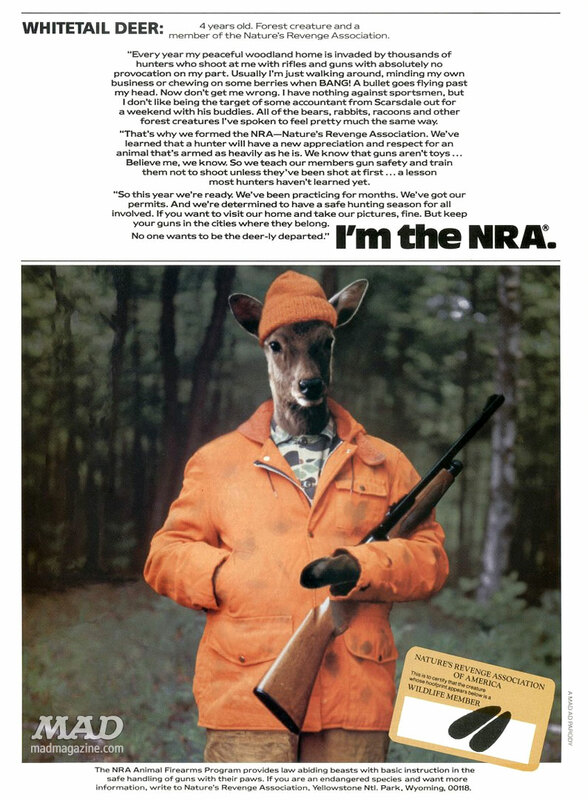 Joe says: "At the risk of blowing my own comedy horn, this parody of an NRA ad, which I wrote with my pal Charlie Kadau, is among my favorite MAD back covers. First, in the pre-Photoshop era, Irving Schild’s photographic wizardry was simply astonishing. But what I love best about this is the back story. Soon after the spoof was published, MAD was deluged with hundreds of letters from angry NRA members, each threatening to 'boycott our advertisers' — at a time when the magazine was advertiser-free. You can’t make this stuff up!"